The Fourth of July is in full boom here at the Disneyland Resort, but the spirit of patriotism has always been alive here. 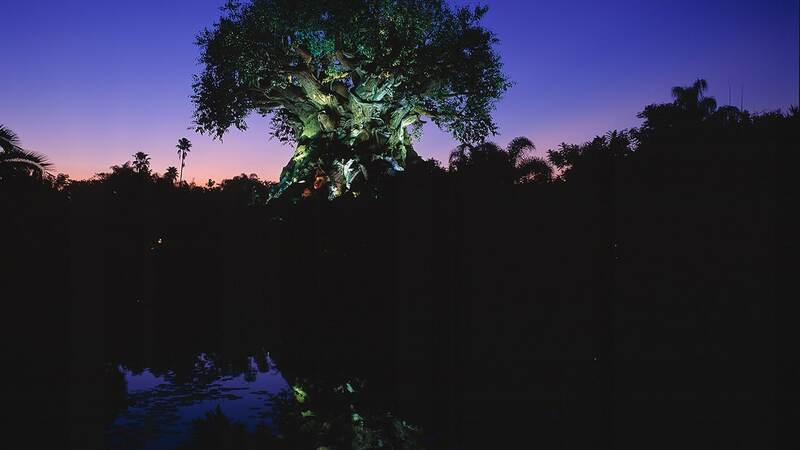 Even before he proclaimed, “here age relives fond memories of the past,” Walt Disney was greatly influenced by his passion for American history when developing ideas for Disneyland. The trails that blazed the American frontier provided the inspiration for Frontierland, while Main Street, U.S.A., is the quintessential American town. 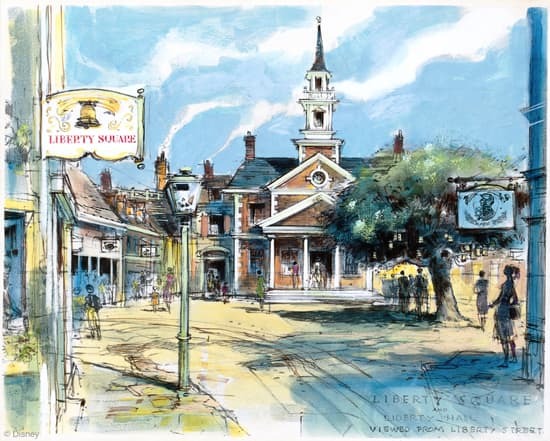 Walt was also looking for a way to incorporate Colonial America into his original Magic Kingdom, and announced Liberty Street as one of the first expansions for Disneyland. Even though we know now that Liberty Street never became a reality here at Disneyland park, today seems the perfect time to look back on this tribute to our nation’s beginnings. Walt Disney announced plans for Liberty Street in 1956, one year after Disneyland opened. Set in the Revolutionary War era, this cul-de-sac would be set on the east side of Main Street, U.S.A., with its entrance just across from where the Mad Hatter store sits. The architecture would be a mixture of several American cities as they existed during the nation’s early years. Some concept designs showed thirteen buildings paying tribute to the original thirteen colonies, featuring merchants and trades that reflected the time period. Not only would guests get to purchase from a blacksmith shop or an apothecary, but Walt envisioned sellers practicing these crafts inside the stores as well. At the end of the cul-de-sac would be Liberty Square (name sound familiar?) which would feature the area’s main attraction inside Independence Hall – The Hall of Presidents – which would present a show titled, “One Nation Under God.” Remember, Audio-Animatronics technology would not enter the picture for a few more years, so the presidents represented inside the attraction would have to be wax figures. A second attraction was planned for this area, called The Hall of Declaration of Independence. This experience would present the dramatic story of the birth of the United States through three scenes inspired by famous paintings depicting that time in history. So why was this land never built? Well, Walt had a lot on his hands in the late 1950s at Disneyland. You may recall three groundbreaking attractions that debuted a few years later … the year 1959 brought the Disneyland-Alweg Monorail System, Walt’s “highway in the sky”; the Matterhorn Bobsleds, considered the world’s first steel roller coaster and the first coaster to allow multiple cars to run simultaneously on the same track; and of course the Submarine Voyage, which joined the Matterhorn and the Monorail as the first the E-ticket attractions. With the development of Audio-Animatronics figures for Walt Disney’s Enchanted Tiki Room in 1963 and later for “Great Moments with Mr. Lincoln” at the 1964 World’s Fair, Imagineers knew they could make Walt’s dream of The Hall of Presidents an even grander reality. In 1971, Walt’s Liberty Street vision was finally realized at Magic Kingdom Park in the Walt Disney World Resort. There, Liberty Square features the Hall of Presidents that Walt Disney dreamed of, and still entertains and educates guests to this day. Very cool. Would love to see more art like this! That was so interesting to read. I truly would have loved to visit the shops Walt envisioned and enjoy the craftsmen practicing their trade before our eyes. Excellent post Erin, very informative and interesting. And I love how Disney embraces our nation and has patriotic elements, including the fabulous Liberty Square in WDW! Thanks for sharing this wonderful and informative post, Erin! It is fascinating to hear about some of Walt’s plans for Disneyland that didn’t actually materialize – but in fact they did several years later at Walt Disney World. Thanks again! What a wonderful, detailed post Erin. Thanks so much for the information! I never knew Liberty Street was planned for Disneyland, and it’s great to see some of the ideas could be used for WDW’s Magic Kingdom. Happy 4th of July!